Unions and progressives have not always had a good strategy for building power through local elections. This is often especially hard in non-partisan elections. An election last week in Oklahoma City showed that it is possible for a democratic left coalition to win in even a deep-red state. On Tuesday, April 5, 2011, Dr. Ed Shadid, MD. won a city council seat by a landslide vote of 62% to 28% against a corporate Democrat—Charlie Swinton–in Oklahoma City—a bastion of the right and far right. 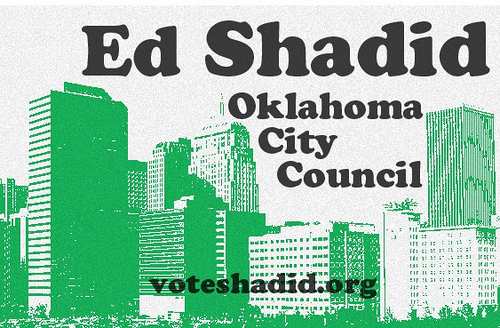 Dr. Shadid’s platform included: more local and organic farming and gardening, promoting healthy life styles, better mass transportation, greater energy efficiency throughout the city, and robust community services for seniors. Dr. Shadid also strongly supported strong collective bargaining rights for public employees. In addition, Dr. Shadid called for local and robust small business economic development in Oklahoma City with no taxpayer funded subsidies for out-of-state businesses competing with locally supported businesses. During the campaign, Dr. Shadid did not take campaign donations from any PAC or special interest group including corporations. This was in contrast to his opponent, Charlie Swinton, in this post-Citizens United era, who received campaign contributions from numerous special interests. A secretly funded PAC, “Committee for Oklahoma City Momentum” that spent at least $410,000 in city races including running ads that attacked Dr. Shadid as “extreme”, also assisted Swinton. Dr. Shadid was endorsed by some individual Green Party members, the fire-fighter’s union, AFSCME, Cimarron Group of the Sierra Club, and two prominent progressive Democrats including Senator Andrew Rice and former state representative Wanda Jo Stapleton. He is related to Dr. Michael Shadid who was a prominent supporter of the Socialist Party and New Deal progressive politics and coopeative medicine in early Oklahoma statehood. Michael Givel is a Norman, Oklahoma progressive and political analyst. Great post, nice to see the write up. This should be a national story. Shadid also told independent expenditure groups to NOT spend any money on his behalf. Incredible.